Through Nirmanshree Constructions, Kudumbashree is ensuring that women are not only trained in construction activities but are also able to generate a sustainable income. 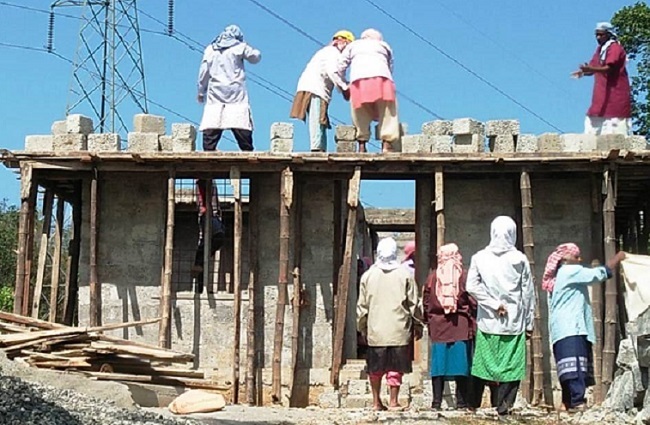 Wearing a shirt over their salwar kameez, and a towel around their head, a group of women stand atop an under-construction building. While one woman passes a huge block of concrete, the other fixes the block on the roof, another woman cements the blocks together. 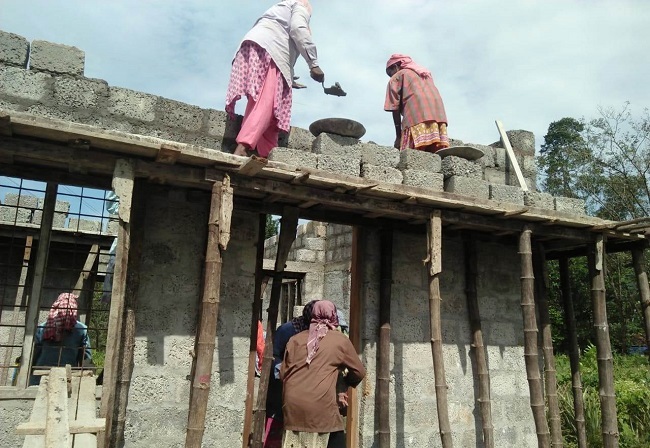 This is Nirmanashree Constructions – a 20-member all-women group, which is in the process of finishing their first project – a home in Kerala’s Idukki district. Nirmanshree Constructions comes under Kudumbashree, the Kerala government’s women’s empowerment programme. Although women make up more than half of the construction labour force, according to Kudumbashree, they are relegated to casual manual work. They lack skill in carpentry, masonry, plumbing, electrical wiring – largely considered male-dominated trades. This is where Kudumbashree comes in, providing training to women in construction related activities, thereby not only enhancing their skill but also ensuring a sustainable income is generated. The idea for Nirmanshree Constructions was born recently when the Velliyamattam Panchayat and Kudumbashree officials realised women in the area needed more employment opportunities. The women on site, who mostly belong to Velliyamattam Panchayat in Idukki, are daily wage workers and small-scale farmers. Many women in the area are engaged in Mahatma Gandhi National Rural Employment Guarantee Act (MGNREGA) to manage their families' daily needs. However, they were unable to manage their daily needs solely from MGNREGA. "Many women under the panchayat are engaged in daily wage work and their income is very low. We were thinking how to increase their income and it was then we formed the women-only construction group under the Panchayat," Velliamattam Panchayath president Sheeba Rajashekharan tells TNM. However, Velliyamattam Panchayat Kudumbashree Chairperson Rasiya Asis says they did meet with receive with resistance from some quarters. "Recently I shared the idea to a group of women in the panchayat to form a women-only construction group. While most were suspicious of the idea, some of them expressed their willingness to participate," says Rasiya. After putting together the 20-member group which includes seven women from the Backward Community, Kudambashree provided a two-week training programme that included theory class about construction methods. Work on their first project at Elamdesham near Thodupuzha in Idukki began about 20 days ago and is expected to be complete in just over two weeks. 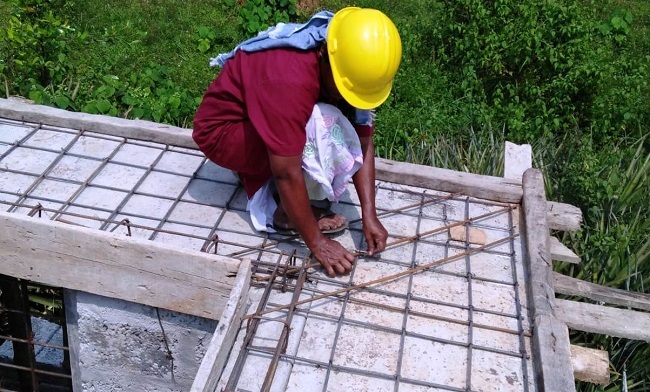 While a male mason provided directions for the construction work of the first project, the all-women group are implementing every aspect of the constructing the home. From making the plan and budget for the home to laying the foundation, building the walls, concreting, painting and other construction tasks are being carried out by the 20-member group. Some women already knew the basics in construction, having engaged in mason work in the past. Once complete, the home will then be handed over to the Velliyamattam Panchayat, as part of the state government’s Life Mission project. Sheeba says more offers have come for the group since construction began. "The project has become a big success and the construction work of the home will be completed soon. The group has already got opportunity to construct another home. The panchayat will give opportunities to construct more homes under the state government’s ‘Life Mission’ and ‘Ashraya’ schemes," says Sheeba. Expressing confidence in the group and their skills, Bindu, a member of Nirmanshree Constructions, says, "When we began the construction of our first home, I doubted how we would be able to do ‘male-oriented’ work. But we have now got the confidence and are ready to manage the construction work of the home." "The training centre officials and Kudumbashree Chairperson assured full support to the Nirmanshree Constructions. We hope it will encourage more women to engage in these works," she adds. Vijayamma Bose. another member says that the new opportunity will provide more income to their families. " We hope that we will get more opportunities to construct homes in the area," says Vijayamma. The women are paid a stipend of Rs 350 per day as part of their training for their first project. Rasiya says they will get full wages – roughly between Rs 800 to Rs 1000 per day - from the next construction onwards.